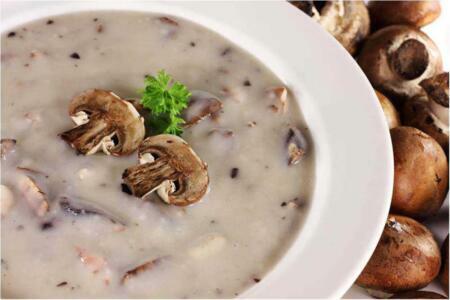 Fresh mushrooms can be added to everyday dishes such as soup, salad, stew, stir-fry, and pasta. 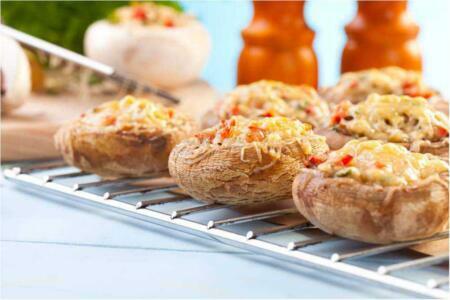 Mushrooms, particularly portabella mushrooms, are often used in place of meat in many dishes. 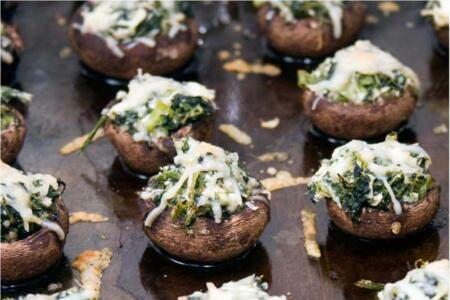 Here are some delicious recipes featuring mushrooms. Heat oven to 400°F. Remove stems from mushrooms, and finely chop stems. Melt butter in large skillet on medium heat. Add chopped stems, onions, and peppers. Cook and stir until tender. Stir in cracker crumbs, cheese, and seasoning. Spoon into mushroom caps. Place on baking sheet. Tip: When preparing mushrooms for stuffing, use a melon baller to carefully scoop a little mushroom flesh from each mushroom cap after removing the stem. Then, use the melon baller to easily scoop the filling mixture into the mushrooms. Heat grill. Use raw baby spinach or sauté the baby spinach in a tablespoon of olive oil and a sprinkle of salt in a large pan on medium high heat, just until it wilts, then set aside. Clean mushrooms and remove stems. Wipe the tops of the mushroom caps with oil from the sun-dried tomatoes. Brush the onion rounds with some olive oil and place them on the grill. Place the mushroom caps on the grill, top side down first. Sprinkle with a little salt. Grill the mushroom caps and the onion rounds for 4 - 5 minutes per side. Grill the burger buns, cut side down, for about 1/2 - 1 minute, until lightly toasted. Layer portobella mushroom with the spinach, sun-dried tomatoes, and onion. 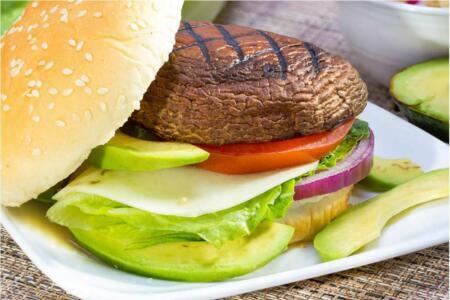 Tip: You can use the portabella mushrooms as a substitute for the burger buns for a low-carb option. Heat oil in large pan over medium heat. Add mushrooms and sauté with garlic. Add steak spice, stir, and add wine. Cook until most of the liquid has evaporated. In a large pot, heat butter over medium heat. Cook onions, stirring for 5 - 7 minutes until softened. Add the mushrooms, 1/2 cup of the stock, paprika, soy sauce, dill-weed, then cover and cook, stirring occasionally for 10 - 15 minutes until mushrooms are softened. Sprinkle with flour and cook for 30 seconds while stirring. Gradually stir in stock, milk, and water. Cook, stirring for 10 minutes until thickened. Remove from heat and stir in sour cream, lemon juice, and pepper. Garnish with parsley. Heat oven to 400°F. Add hot water to stuffing mix in large bowl and stir until moistened. Remove and then chop mushroom stems. Melt butter in skillet on medium heat. Add chopped stems and garlic and cook for approximately 5 minutes while stirring. Add to stuffing with spinach and cheeses and mix well. Spoon stuffing mixture into mushroom caps. Place on baking sheet. 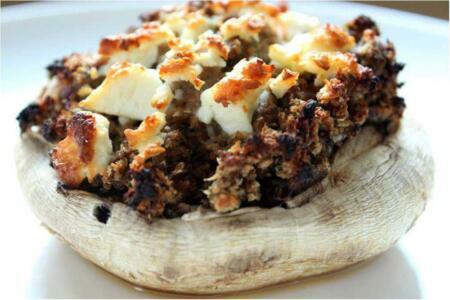 Bake 20 minutes or until mushrooms are tender and filling is heated through. Melt butter in a medium saucepan over medium heat. Add the mushrooms and garlic, cook and stir until the water from the mushrooms has evaporated. Sprinkle in the flour, stir, and slowly add the milk, stirring constantly. Heat and continue stirring until the sauce begins to thicken and starts to simmer. Add the cream cheese and cook, stirring, until smooth. Add steamed broccoli (optional) and mixture to heat through. Remove from heat and stir in the parmesan cheese. Meanwhile, cook the fettucine according to package directions. 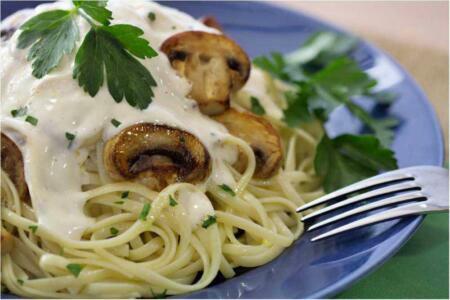 Drain thoroughly, and toss with mushroom sauce. Season to taste with salt and pepper, and serve immediately. Heat oven to 350°F. Clean and remove stems from mushrooms. Mix remaining ingredients. Spoon mixture into mushroom caps. Place on baking sheet. Back 18 - 20 minutes or until heated through. Tip: Save the mushrooms liquid in the pan to add to soups, stews, etc. Preheat oven to 425°F. In skillet, melt butter, and add mushrooms and onions. Cook until tender, about 10 minutes. Stir in flour, cottage cheese, sherry, parsley, and pepper. Pour into pie filling. Bake on bottom rack of oven for 40 - 50 minutes. Half way through, cover edges with foil to prevent burning. Cool and serve. Preheat oven to 350°F. If frozen spinach is not already thawed, thaw it in the microwave. Empty the box into a colander and drain well. 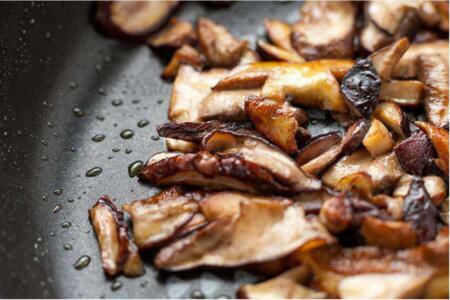 Thinly slice mushrooms and place in a skillet with non-stick spray. Add the minced garlic, and sprinkle with a little salt and pepper. Turn the heat on to medium-high and sauté the mushrooms until they release their moisture and no more water remains on the bottom of the skillet (5 - 7 minutes). Spray a pie dish with non-stick spray. Spread the spinach out on the bottom of the pie dish. Next, add the cooked mushrooms and crumbled feta. 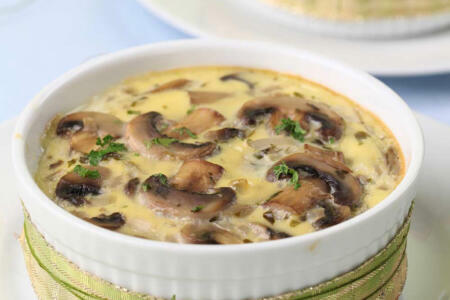 While the mushrooms are cooking, whisk together the eggs in a medium bowl. Add the milk, parmesan, and another sprinkle of pepper, and whisk together. Pour this mixture into the pie dish over the spinach, mushrooms, and feta. Sprinkle the shredded mozzarella cheese over top. 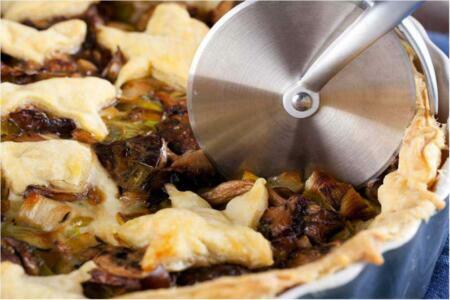 Place the pie dish on a baking sheet for easy transfer into the oven. Place the quiche into the preheated oven and bake for 45 minutes to an hour, until it is golden brown on top and the center is solid. Slice and serve.